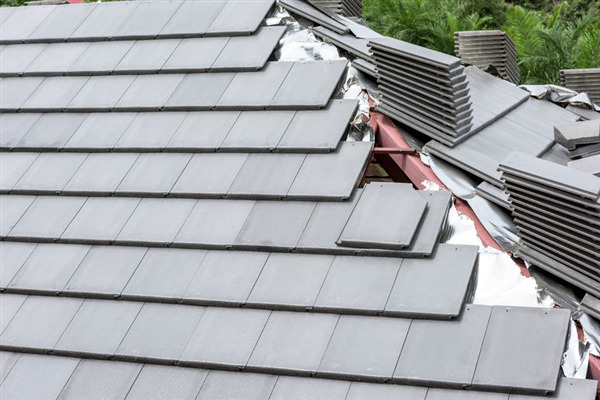 When it comes to installing a roof, safety should be your primary concern at all times. Skipping good safety practices because they take too much time makes it all the more likely an accident will happen. There are many safety issues to consider if you’re planning to hire an Intelligent Design roofing crew to install your roof. It’s imperative that you take the proper precautions in order to avoid serious injury or even death. Make sure you have a clean, organized work area. Block it off from children and pets. Identify and avoid all site danger areas, such as dangerous power lines, unsafe roof access areas, and underground hazards. Inspect your ladder carefully before use. Never use a damaged or makeshift ladder. Place your ladder on solid, level footing. Tie your ladder off at the top or secure with a plywood brace. When accessing the ladder, anchor the base of the ladder with stakes driven into the ground or use a heavy object such as a cinder block. Make sure to climb your ladder safely—always face the ladder, use one rung at a time, never slide down a ladder. When ascending or descending, use the rails, not the rungs. Don’t push a ladder into stretch it because it’s too short. That makes it too steep and unstable. Make sure you don’t have to reach or stretch too far off the ladder. Never leave ladders unattended. Remove all ladders from your work area every day or lock them together on the ground overnight. This will help prevent children and other unauthorized people from climbing the ladders and getting injured. Electricity can leap or “arc” from a wire to a ladder several feet away. Make sure to use a non-conductive ladder of wood or fiberglass when working near wires. Never touch electrical wires with your hands or tools. Remember that metal materials such as flashing and drip edge should never touch or come near electrical wires. Electrical issues are among your most important concerns during residential roofing installation. Make a material handling plan before your products are on site. When lifting heavy materials, always bend at the knees to use your legs. Bending at the waist will put unnecessary – and often painful – strain on your back. Heavy materials must be delivered to and moved around a roofing job site Be sure to carry one bundle at a time—carrying too many materials fatigues the body and is unsafe on ladders and rooftops. Intelligent Design believes in safe practices for all our workers and clients. We offer complete roofing that follows best safety practices and state and city codes in Minneapolis, Minnesota. To schedule a consultation with an Intelligent Design contractor, call us at 763-315-0745. You can also send a message to our contact page.